After breaching that descending triangle resistance I showed y’all yesterday, USD/CAD seems ready to go for longer-term gains. Just how high could this pair go? Zooming out to the daily time frame reveals that price might have its sights set on the broken support zone around the 1.2400 major psychological mark. This coincides with the 50% Fibonacci retracement level and might keep further gains in check, as stochastic is already indicating overbought conditions. Once the selloff resumes, USD/CAD could make its way back down to the previous lows close to the 1.1900 mark. Just make sure you set a wide stop past the highest Fib if you’re thinking of shorting at the area of interest. One top, two tops… Ha! Ha! 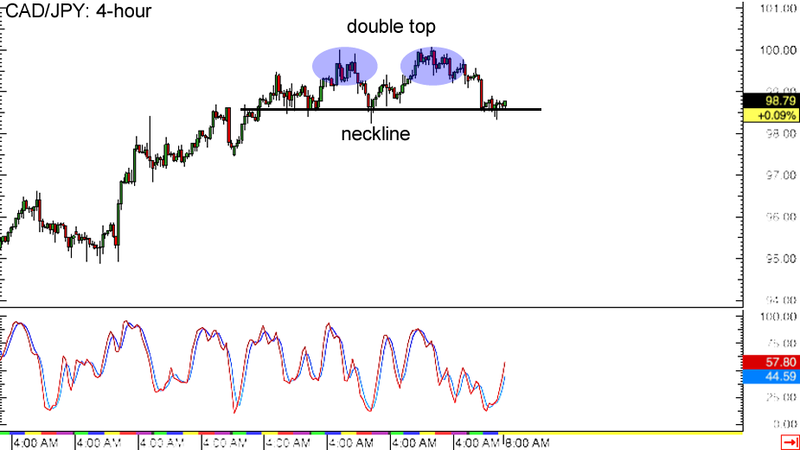 Excuse my lousy Count Dracula impression but I’ve just spotted a neat double top formation on CAD/JPY’s 4-hour forex chart. This suggests that the pair is already tired of its recent climb and may be looking to make its descent soon. Of course price has to break below the neckline support around the 98.50 minor psychological level before confirming the potential downtrend, which might last by around 150 pips or the same height as the chart pattern. Stochastic is pointing up for now, indicating that Loonie bulls are strengthening. If the neckline holds as strong support, another bounce towards the previous highs at the 100.00 mark could take place. 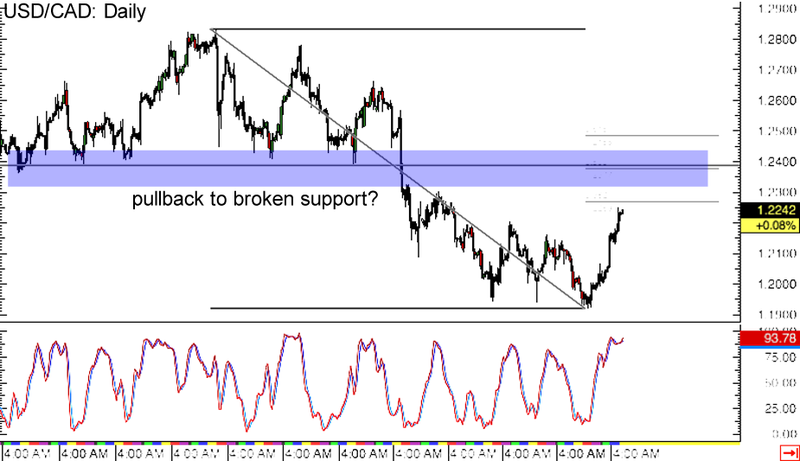 Where to now, EUR/CAD? The pair recently bounced off the channel resistance at the 1.3800 major psychological level but is now stalling at the mid-channel area of interest. A bearish flag has formed right there, indicating a potential continuation of the selloff all the way to the channel support at the 1.3500 major psychological handle. 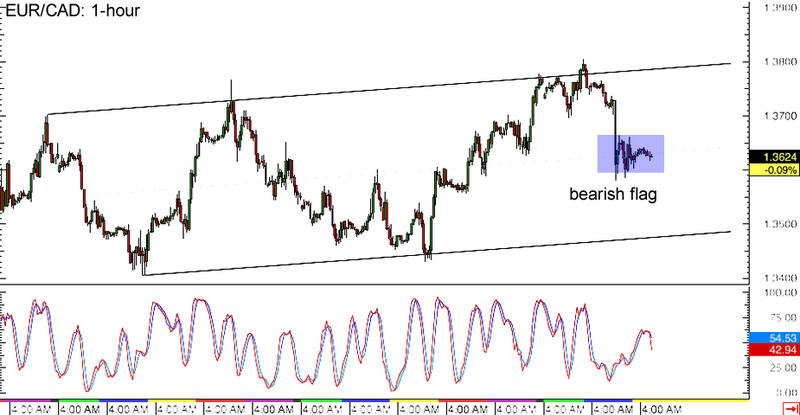 At the same time, stochastic is pointing down, suggesting that euro bears could push the pair lower later on. If you’re bearish on this pair, you could wait for a break below the short-term consolidation pattern to catch the drop to the bottom of the channel. But if you’re hoping to go long, better wait for reversal candlesticks at 1.3500 or for stochastic to turn up from the oversold region.